In a recent development on the confirmation of President Donald Trump's pick for the Secretary of Education, Betsy DeVos, daughter-in-law of multi-level marketing (pyramid scheme) billionaire Rich DeVos, DeVos had stated that during the congressional hearings she had learned that the word "Algebra" derives from the Arabic "al-jabr," which means a "reunion of broken parts" and that upon realizing its origin that she will work hard with congress to try and eliminate the studies from public curriculum. "I support school choice. Choice for the parents, especially those of different backgrounds like Christianity," DeVos said when pressed on her criticisms of the unifying principles of mathematics. "For good Christian parents to be forced to have their children learn the principles of Islam is appalling and I will look into opening up options. America, a Christian nation, should return to biblical math and God's praises and not indoctrination to alternate faiths." 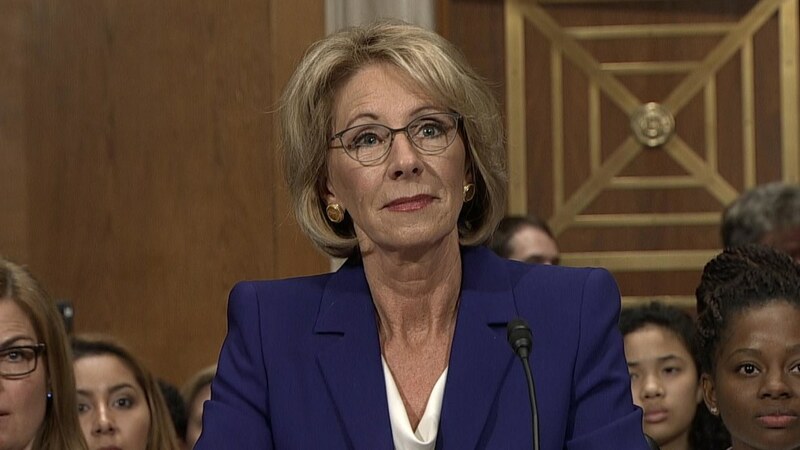 When Democratic members of congress attempted to have her clarify her position DeVos refused to answer, stating that once the new administration gets situated and has an opportunity to review every aspect of governance than she could officially form an opinion. Until then she only has her closely held beliefs and alternate facts, which weigh heavily on her decisions. "I believe the mandate [Donald Trump] received from the election is pretty clear. We need to bring back control of the schools to the people and not bureaucrats in the swamp. Communities need to be in charge to make America great again," adding "perhaps we can even rename the study and make it more American. That will allow for better understanding and growth and proficiency." Asked if she intended to continue the push for Common Core, DeVos applauded the former First Lady's campaign to get school children to be healthier and increase activity exercising their core muscles more frequently but did not agree with the Federal overreach and believed such actions are best kept at the local level. The administration initially refused to comment but then later released a statement that "everything is on the table" and that we need to "bring back education" to America. You know, I can actually hear her saying just this.